March 23rd is National Chip and Dip Day. When we think of chips and dip, salty chips pop into mind, with creamy dips, guacamole or salsa. But today’s tip is: For snacking or a fun dessert, go sweet with cinnamon-sugar flavored chips and a sweet dip. WHAT DIP SHOULD YOU USE? Caramel Sauce: Cinnamon and caramel are a delicious combination. Simply warm a bowl of caramel sauce in the microwave. Chocolate Sauce: Melt chocolate chips or a chopped chocolate bar in the microwave for 45 seconds. You can dip chps in the warm chocolate, or dip the chips and place on wax paper until the chocolate sets. Dulce de Leche Sauce: As with caramel sauce, simply warm a bowl of dulce de leche in the microwave. Mexican Fried Ice Cream: Warm the chips in a toaster oven for 5 minutes on low heat. Place in individual bowls and top with a scoop of vanilla ice cream. 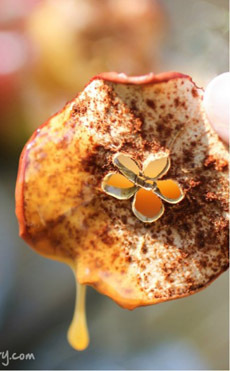 Garnish with chocolate or caramel sauce a drizzle of honey. You can also add fresh berries. Nutella: Place a few spoonfuls in the microwave for 30 seconds, then drizzle over the chips or simply dip them. Sweet “Nachos”: Warm the chips, drizzle with warmed sauce, and garnish with butterscotch or chocolate chips or mini marshmallows. 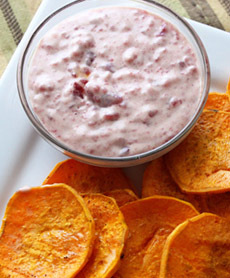 Yogurt Dip: Use fruit or vanilla yogurt straight, or augment it with mini chocolate chips or other inclusions. Your own recipe for a sweet dip. Cheesecake dip, anyone? Apple chips with a salted caramel dip. Photo © DizzyBusyAndHungry.com. Here’s the recipe.